Jejunogastric intussusception (JGI) is a rare but potentially very serious complication of gastrectomy or gastrojejunostomy. To avoid mortality early diagnosis and prompt surgical intervention is mandatory. A young man presented with epigastric pain and bilous vomiting followed by hematemesis,10 years after vagotomy and gastrojejunostomy for a bleeding duodenal ulcer. Emergency endoscopy showed JGI and the CT scan of the abdomen was compatible with this diagnosis. At laparotomy a retrograde type II, JGI was confirmed and managed by reduction of JGI without intestinal resection. Postoperative recovery was uneventful. JGI is a rare condition and less than 200 cases have been published since its first description in 1914. The clinical picture is almost diagnostic. Endoscopy performed by someone familiar with this rare entity is certainly diagnostic and CT-Scan of the abdomen could also help. There is no medical treatment for acute JGI and the correct treatment is surgical intervention as soon as possible. Jejunogastric intussusception (JGI) is a rare complication of gastrectomy or gastrojejunostomy which can occur any time after the gastric operation. Early diagnosis of this condition and prompt surgical intervention is mandatory: a mortality of 10% and even as high as of 50% has been reported if operation has been performed 48 h or later after the onset of severe symptoms, respectively[3,4]. Emergency endoscopy, carried out by endoscopists aware of this condition and its endoscopic picture, can put the correct diagnosis very soon. We describe a young patient with JGI, who was admitted to the hospital with the diagnosis of upper gastrointestinal (GI) bleeding. JGI was subsequently diagnosed by an emergency upper GI endoscopy. A 31-year-old patient was admitted to the hospital because 24 h before he presented severe colicky epigastric pain followed by bilous vomiting and subsequently by hematemesis. There was a past history of vagotomy and gastrojejunostomy carried out 10 years before because of a bleeding duodenal ulcer. Postoperative recovery was uneventful and, since then, the only complaint of the patient was the feeling of an early postprandial gastric fullness. On physical examination there was a mildly distented abdomen, epigastric tenderness and, on deep palpation, a vague feeling of an epigastric mass. The usual laboratory investigation was unremarkable except of an elevated WBC (156103/L). Emergency endoscopy disclosed a bulky, lobulated, congestive mass with petechial bleeding, protruding through the stoma into the gastric lumen, that occupied practically the anterior wall of the stomach and part of the greater curvature. The mass was sharply demarcated and the adjacent gastric mucosa was normal (fig. 1,2,3,4). 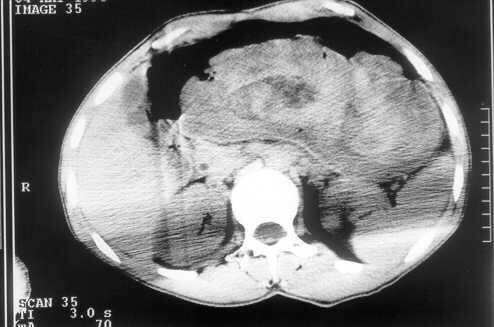 An emergency CT scan of the abdomen was performed: it showed a distented stomach containing a non-homogeneous mass and a small quantity of ascitic fluid (fig. 5,6). The diagnosis of JGI was established and a laparotomy was performed. At laparotomy, the efferent loop was found intussuscepted in a retrograde way into the gastric lumen. Reduction of the JGI was performed without resection of the intussuscepted intestine, that was oedematous with serosal petechiae but absolutely viable. Postoperative recovery was uneventful and the patient was discharged home. Endoscopic picture: A bulky, lobulated congestive mass with petechial hemorrhage is seen. 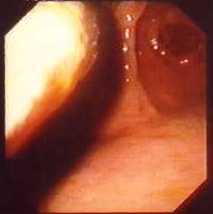 Endoscopic picture: A congested intestinal loop protruding through the stoma into the stomach. Jejunogastric intussusception (JGI) was described in 1914 by Bozzi in a patient with gastrojejunostomy. Eight years later this complication was also reported in a patient with Billroth II resection. Subsequently, a large number of isolated cases and small series have been published and the reviews of the literature showed that less than 200 cases have been reported[1,2,7,8,9,10]. Thus, JGI seems to be a rare complication after gastrojejunostomy or Billroth II gastrectomy; it also has been described rarely in association with previously placed gastrostomy tubes. Occasionally, jejunojejunal or jejunoduodenal intussusception have been observed after total gastrectomy[12,13,14] and one case of duodenogastric intussusception after Billroth I gastrectomy. It is interesting to point out that only 16 well-documented cases have been recognized at the Mayo Clinic in a period of 72 (1907-1980) years. Three anatomic types of JGI have been described: type I concerns the afferent loop, type II the efferent loop and type III represents a combined form. It has been stated that type II or retrograde efferent loop intussusception is the most common (80%) with the two other types accounting for 10% each. In the case presented, a type II JGI was documented. There is a wide variation in the lapse time between the gastric operation and the JGI to occur: 6 days to 20 years and 8 days to 19 years in patients with gastroanastomosis and partial gastrectomy respectively. Ten years was the lapse time in the present case. The cause(s) of JGI is poorly understood. Various factors have been incriminated such as hyperacidity, long afferent loop, jejunal spasm with abnormal motility, increased intra-abdominal pressure, retrograde peristalsis etc. Probably, retrograde peristalsis, which can occur in normal people prior to gastric surgery, seems to be accepted as the cause of type II JGI by most authors[1,16]. Two forms of JGI have been clinically recognized: an acute and a chronic form. In the acute form, incarceration and strangulation of the intussuscepted loop generally occur whilst spontaneous reduction is usual in the chronic type. Thus, the acute form is characterized by acute severe colicky epigastric pain, vomiting and, subsequently, hematemesis. Epigastric tenderness and a palpable abdominal mass can be observed in about 50% and signs of high intestinal obstruction can also be found[1,17,18]. It should be pointed out that a sudden onset of epigastric pain, vomiting and subsequent hematemesis, and a palpable epigastric mass in a patient with a previous gastric surgery are thought as the classic triad of JGI. The picture was absolutely typical in the case described here. In the chronic form, the symptoms may be roughly similar to the acute form but milder, transient and subside spontaneously. Thus, the patient complains for recurrent episodes of upper abdominal discomfort that is exacerbated by the food and usually subsides 1-1.5 h after the meal. Nausea and vomiting can be also present but epigastric pain is the main patient's complaint. Early diagnosis of the acute form is of paramount importance[3,4]. The clinical picture is almost diagnostic to the alert, sensitized physician. X-ray can be occasionally diagnostic. Endoscopy [21,22] performed by someone familiar with this rare entity, is certainly diagnostic: this was the case in the patient presented here. In the chronic form, the diagnosis is difficult. In many of such patients, the correct diagnosis has never been established. The main reason for this is that upper GI series or upper GI endoscopy must be performed during the symptomatic period for the diagnosis to be confirmed. However, it has been suggested that in the asymptomatic period, the provocation of JGI during endoscopy by the use of a jet of water directed towards the anastomotic stoma may be diagnostic of the chronic form. It is clear that there is no medical treatment for acute JGI and the correct treatment is the surgical intervention as soon as possible. Surgical options include reduction, resection, revision of the anastomosis and the take-down of the anastomosis, depending on the conditions found during the operation. The best way to prevent recurrence, if any, has not been identified yet[1,23]. Endoscopic picture: Another view showing that the mass was sharply demarcated and the adjacent gastric mucosa was normal. Endoscopic picture: Another view of a congested intestinal loop. Emergency CT- Scan of the abdomen: Dilated stomach with intragastric non-homogeneous mass compatible with bowel loops. 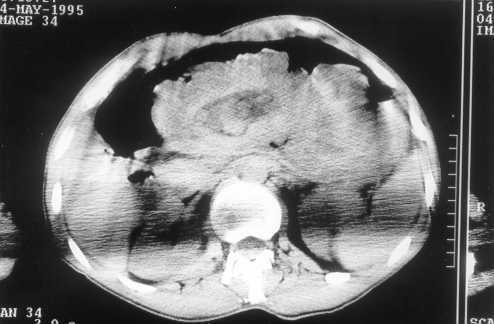 Emergency CT- Scan of the abdomen: Another section showing a dilated stomach with intragastric non-homogeneous mass compatible with bowel loops.